Join Neville and Millicent Gloomwhisper (Ian Schempp and Elicia Wickstead) as they peel back the veil separating this world from the next. These two vaunted mediums will be available to answer your questions about spooks, spirits, ghosts, ghouls, and the occult, as well as spin yarns about their adventures in the world's most haunted locations. The Gloomwhisper Entrancement has been unsettling audiences since September of 2014 on several stages in the Seattle area, including Jet City Improv, The Pocket Theater, and The Rendezvous. 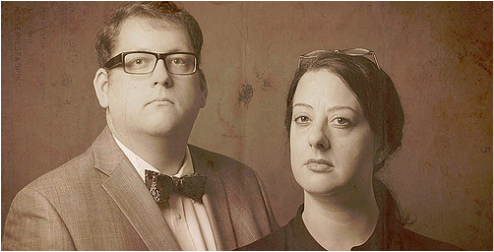 The show was born in the fires of Ian and Elicia's shared passion for ghosts, the occult, and ridiculous accents and has continued to be fueled by those ample resources. The Gloomwhisper Entrancement features Ian Schempp and Elicia Wickstead. This will be their fourth appearance at SFIT. Visit the Gloomwhisper Entrancement on Facebook!